Working for myself usually means my business meeting outfits can be a little more casual and fun. This outfit was exactly that. I love the way the casual baseball tee dresses down the more conservative wool trousers. My Loeffler Randall wedges are an interesting mix of casual and dressy--the low height makes them easy but the patent toe makes them look fancy. Plus, my Camille Zarsky envelope clutch is the perfect accessory for a fashionable coffee meeting. i just LOVE your pants! so chic! A great outfit, you've definitely found the right balance of smart and casual! Wow, you are stunning! This is such a beautiful outfit. What a perfect look! I love those pants. Love this outfit.. So effortlessly chic!! Love stripes...it seems so french and frou fou chic. what a great get-up! i love that this shirt looks like two layers (a vest over long sleeves). Very good pairing of dressy and casual. The top's a great cut and design - love it! 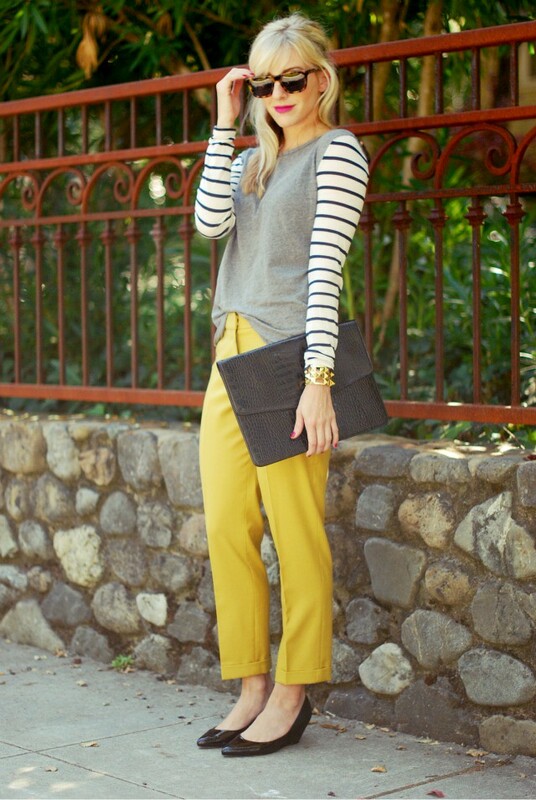 Those lemon hued trousers are such a delight! Love the shoes and clutch! This has to be one of my all time favorites! the clutch is amazing, i love the color of the j.crew trousers and the shoes just pull it all together. casual, comfortable and very chic! Loving your outfit and I'm such a fan of the pants... they are so flattering! You look great! :) Loving the pop of color! Love this outfit. The color of the pants is great. 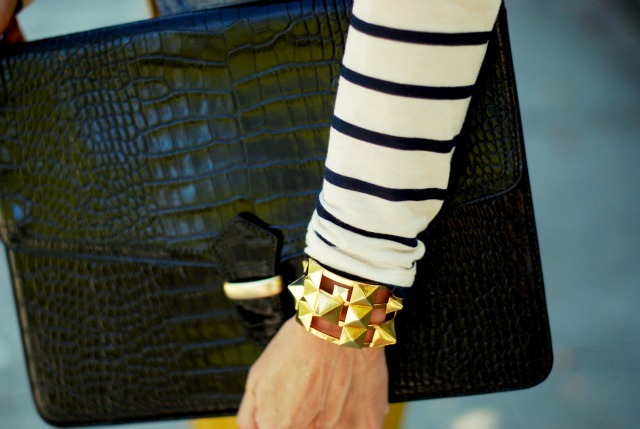 Love the studded bracelet! Those shoes are great too! what a stylish ensemble! 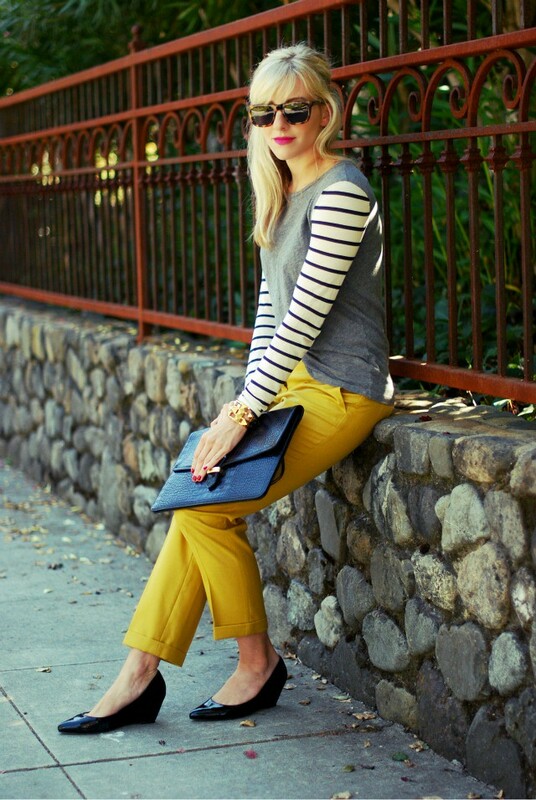 the twist on the nautical top paired with the bright yellow cropped trousers = PERFECTION! Great look! Love the pants and the clutch! Cute cute cute! Love those pants and I adore that you paired it with a striped top. Oh I love your yellow pants! They look so cute styled like that. GAH! I love love love those pants!! you look so chic in this... that clutch is also TOO FAB! Perfect color and pattern mix! You make it look so easy, love the shoes! I really love this outfit - it's bright and fun without trying hard :) Those shoes are perfect too! Such a fab outfit! Those trousers are awesome on you! you pulled this together incredibly well, I love how effortless this looks on you! This is such a sophisticated outfit. I love the brightness of the pants. lookin' uber lovely lady - you had me at the shoes! This outfit is great. I love the pop of your pink lips and the bright yellow pants! Great! Nice dresses, nice girls so perfect post. Thanks for sharing. I have wanted these trousers for a while now...I'm looking at the sweet tangerine one. So bright, fun, yet chic at the same time. The yellow one suits you, and although the trousers are more dressy, your outfit combo dresses it down just a bit. You look great! Love this classic, chic look Taylor! You look lovely in yellow! Such a fun way to wear trousers. I've been eyeing those shoes for a while now. You're right that they're the perfect mix of dressy and casual. You look so pretty, A perfect balance between casual and glam. the bracelet is just perfect! totally...AMAZING how you mizxed the colors and stripes of the top with those yellow pants...LOVE. and your portfolio clutch...I WANT SO BAD!! What a perfect mix of casual and dressy! Oh goodness I was so close to buying that shirt! I put it back at the last moment, and now I'm completely regretting it. It's perfect with those pants! Featured a link to this post on my blog today! Hope you don't mind:) I love it! Your pants are to die for!